But times are changing. Loyalty to the old Norse Gods is fading, and the followers of the mysterious &ldquo White Christ&rdquo are gaining power across Europe. Hired as relic hunters, the Oathsworn are sent in search of a sword believed to have killed the White Christ. 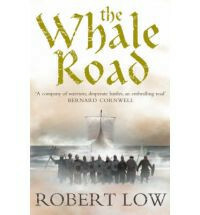 Their quest will lead them onto the deep and treacherous waters of the whale road, toward the cursed treasure of Attila the Hun and to a challenge that presents the ultimate threat.